Interior of the Old Catholic Church. 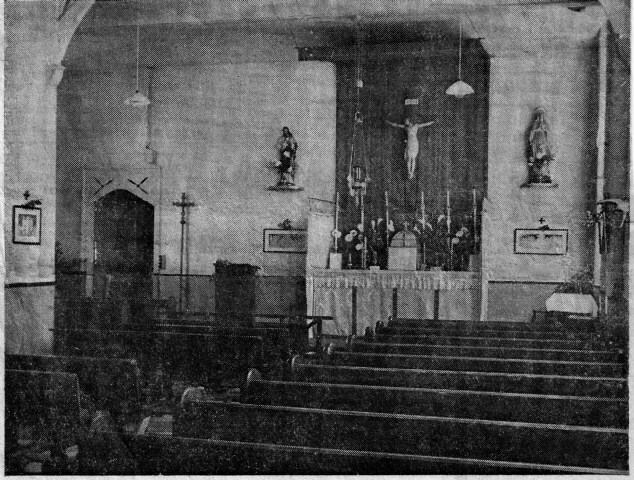 The picture shows the only photograph known to date of the inside of the old Catholic church in CHapel Street. It is taken from the issue of the Bicester Advertiser dated 6th January 1961 and an article, below, announcing the start of building work on the new church in the Causeway. Visable in the photograph are statues of Our Lady (the one left by the Olivetan Nuns?) and the Sacred Heart flanking the altar as well as the processional cross that appears in may of the procession pictues, in addition to the suspended sanctuary lamp. The construction of Bicester’s new Roman Catholic Church is expected to begin in early February. The church is to be built in two phases; the first, which will accommodate 350 people and take a year to complete, is estimated at a cost of £25,000. The site for the new church will be opposite the Parish Church at the rear of Henley House. The church has been designed by the architects, Arthur Fairbrother and Partners, so that it may be extended at a later date. An interesting feature of the first erection will be the sliding and folding screen, which when open, will allow the combination of two sacristies providing a large room for meetings or for use as a weekday chapel. An essential feature of the design is harmony with the local characteristics. A brick has been chosen that will blend perfectly with the nearby buildings many of which are built in Cotswold stone. The construction of the second phase is not envisaged in the near future, but when built it will consist of the sanctuary proper, surmounted by a tower, and additional seating accommodation which will be provided by the extension of the transepts. It is expected that a stone sculpture will surmount the front entrance door. Heating will be provided by an under-floor electric system, operation during “off peak” periods, which is considered to be very suitable for this type of country church. The builders of the new church will be Norman Collison and Son of Bicester. The present Catholic Church in Chapel Street, which seats a congregation of 200, is proving too small for Bicester’s growing Catholic community. In 1906 eight Benedictine nuns on to the old monastic buildings, known as the Old Priory. Later, in 1908, part of the nun’s chapel was opened for public use, but it was not until 1920 that the whole chapel was thrown open to the public. This is being used as the Catholic Church at the present time. Many thanks to Monica Smith for saving the newspaper cutting.